We have released a new version of the AIT Voting Extension. The new version comes with new features as well as with some bugfixes which we are going to explain in this blog post. Besides the functionality improvements we changed the hosting of the extension from Azure to hosting it directly in Azure DevOps. Further we did a lot of clean-up operations in the backend which makes it easier for us to add new features in the future. The admin page to create and administer the settings of a voting got a little redesign. It not only comes with a fresh look but also with the new possibility to configure the amount of votes for a voting. On top of that voting settings can now be changed during an ongoing voting without having to stop it (cf. Figure 1 (1)). When using this feature please be aware that in some cases your votes and thus the current voting results are resetted. This is done when the voting level or the number of allowed votes is changed. Last but not least the admin page lets you now pause a running voting (cf. Figure 1 (2)). So did you ever want to stop people from voting but still see the voting result? Now you can! Just pause the voting and resume it later, if you want to let people continue to vote. 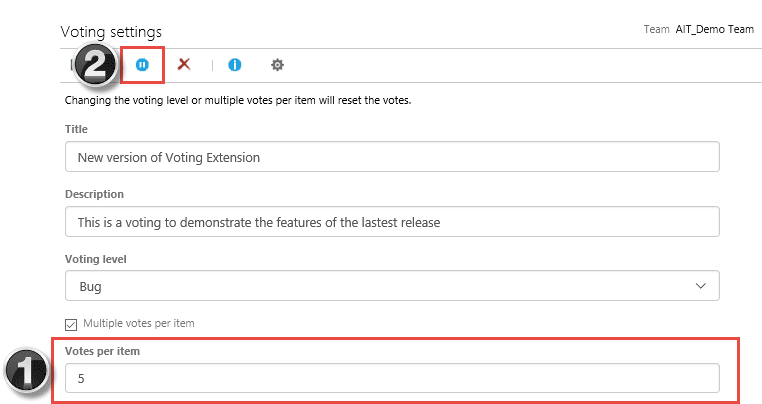 Since June 2018 a preview of the new navigation experience is available in Azure DevOps which was not usable with the last version of the AIT Voting Extension. With the new release we now support the new Azure DevOps navigation experience. Your last selected team will always be shown on the voting page when you come back from another site. Until now work items in a voting from child area paths were always loaded. This is fixed now so that the team’s area path configuration determines if work items from child area paths are included. We enhanced our data protection dialog to make it easier for you to find the relevant information. The link to the admin page is now fixed. Six months ago we made the AIT Voting Extension available as OpenSource on GitHub. A good time to thank all contributors that are engaged in pushing the extension forward!